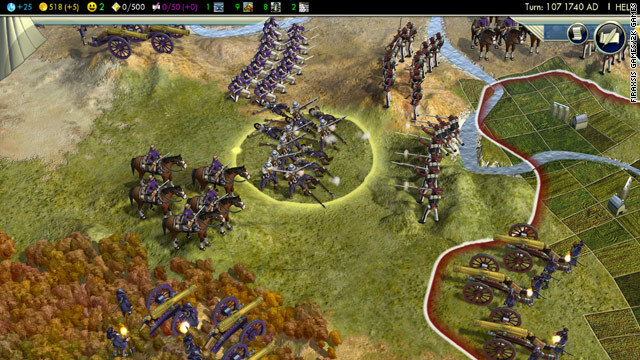 Combat in "Civilization V" gets rid of stacking a bunch of troops in one place and emphasizes ranged weapons. (CNN) -- A early look at "Civilization V" shows the strategy game to have a familiar feel for long-time fans, but radical changes to make the well-known series fresh and exciting. "Civilization V" (Firaxsis Games/2K Games) is a turn-based, strategy computer game where players attempt to conquer the world by means of force, politics or cultural influences. It is the latest in a long line of games and expansion packs in the series that began in 1991. CNN was provided a preview copy of the game that still had some bugs in the works. While we tested it, changes were made to correct some issues that cropped up. This version also did not offer any multiplayer action or modding, where players can make changes or create scenarios. After loading a breathtakingly rendered two-minute cinematic intro to thegame and getting through the start menu, the game hits you with its first major change -- map hexes. Instead of the familiar square grid, the maps and movement are done along a hex grid, offering greater flexibility of movement and a more realistic-looking map. Combat units are very familiar, with minor changes to units from the various cultures represented. During battles, only one combat unit is allowed per hex -- meaning no more stacking of forces to overrun an opponent. This definitely changes the strategy on how conflicts are carried out and won. Ranged units, like archers and catapults, can fire from a distance, so combat becomes a process of softening up the enemy with arrows before sending in the ground troops for the killing blow. Battles are also more protracted. Units have hit points, measuring how much life they have left, and not all hit points are immediately eliminated in one battle. This allows wounded units to withdraw and fight another day. Resources are in abundance and you'll need all you can find. Items like iron and horses will help arm your military while gems, marble and incense please your population and inspire them to work more efficiently. City expansion in the game is more measured now and takes more time to do properly than in previous versions. Expand too fast and the people become unhappy. Not fast enough and your supply of food and gold will be quickly sucked up. Also, expansion takes place more realistically as resource hexes are used up quicker than empty grassland hexes while building a city. Gold, in particular, is vitally important to just about every aspect of the game. You can purchase land to expand your empire, buy military units for a sudden offensive rush, or obtain new buildings without spending the time to build them. It can also be used to sway other leaders and city-states -- independent civilizations that do not expand, but can be conquered or parlayed with. More options about your civilization's culture allow for greater flexibility and more bonuses as the player continues to increase his influence. There are still some game play issues that need to be addressed, but the team at Friaxis has some time. They are still working on the tech tree and dealing with some movement glitches that keep the game balance on an even keel. Striving to build up a thriving populous while dealing with up to 12 other civilizations and 24 city-states that can appear on a single map will hook players into "Civ V."
The early changes will almost certainly keep many gamers will be up late at night to play "just one more turn." "Civilization V" is due out in North America on September 21for PCs only. It will be available in Europe three days later.